Devoted to sculpture since 1972, Valencian Miquel Navarro soon began to develop a project that would exert a decisive influence on his entire practice and plant the seed for all his subsequent production: the sculptural series of La ciutat 1973-1974. Placed on the floor, pedestal-free, these series comprise a collection of geometric modules of different shapes, sizes and materials, grouped together in compositions simulating the urban network of streets and avenues, as if they were miniature cities. Initially made from baked clay, in the 1080s these pieces also incorporated metals like iron, zinc and aluminium. Navarro’s cities generate a dialogue between sculpture and architecture, encouraging a revision of the notions of space and urban landscape. 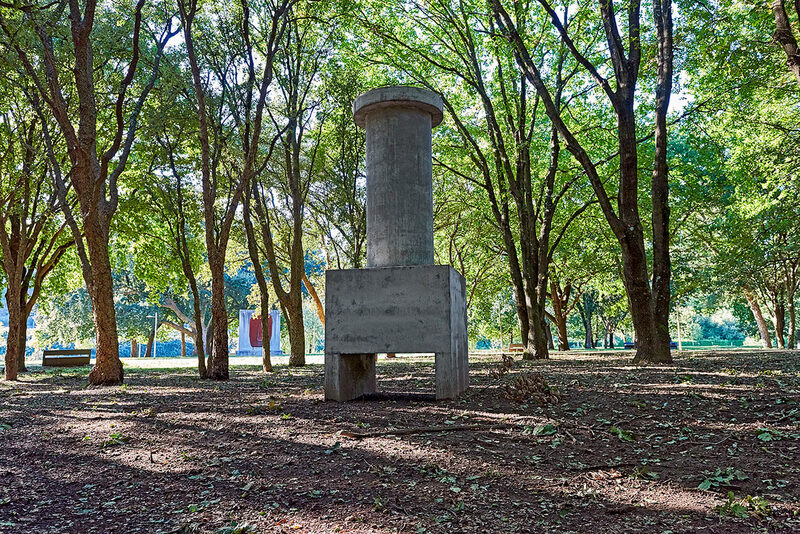 Following the same ideas lying at the foundation of his entire oeuvre, Miquel Navarro’s public art is usually made up of simple volumes (cylinders, cones, cubes), vertically combined so as to create shapes astride abstraction and representation, establishing a dialogue with the cityscape for which they have been created. Casa de paso [Passageway house] is a good example of Navarro’s sculptural narrative.